Networking has always been a focus for The Sign Depot. Through networking we build great business relationships within our community. This is how the Cambridge Pallet reception sign came about. Through connecting with Jorge Meneses we were able to refer business back and forth between our companies and learn more about our interests outside of our companies as well. In fact we are now committee members for Movember KW, swap vacation stories and assist each other with community involvement fundraising events. 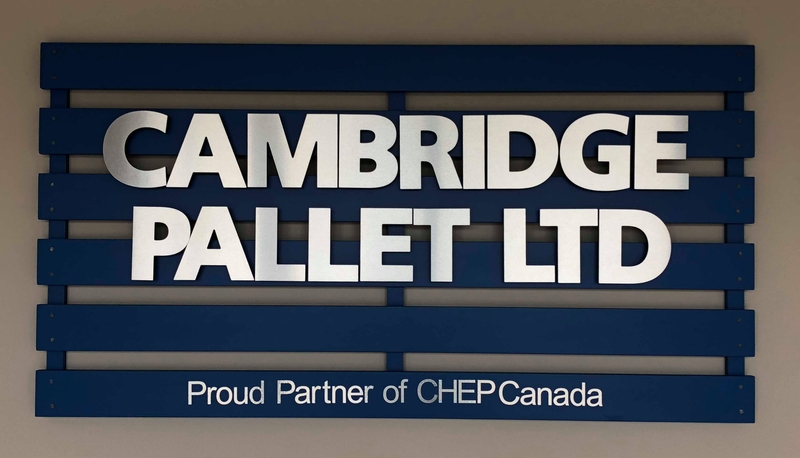 Because we have gotten to know each other well throughout the years, when it came to creating a sign for Cambridge Pallet, it became a collaborative effort. Jorge had let us know that Cambridge Pallet was looking for an interior sign for their office area. He envisioned steel letters in the reception area. We suggested to take it one step further and have a replica wood pallet added to the sign design. These sign ideas were put together to create a sign that reflects their company and their brand. While this might not be the exact definition of collaborative design, we feel that this was a great way to work together to create a unique 3 dimensional sign. 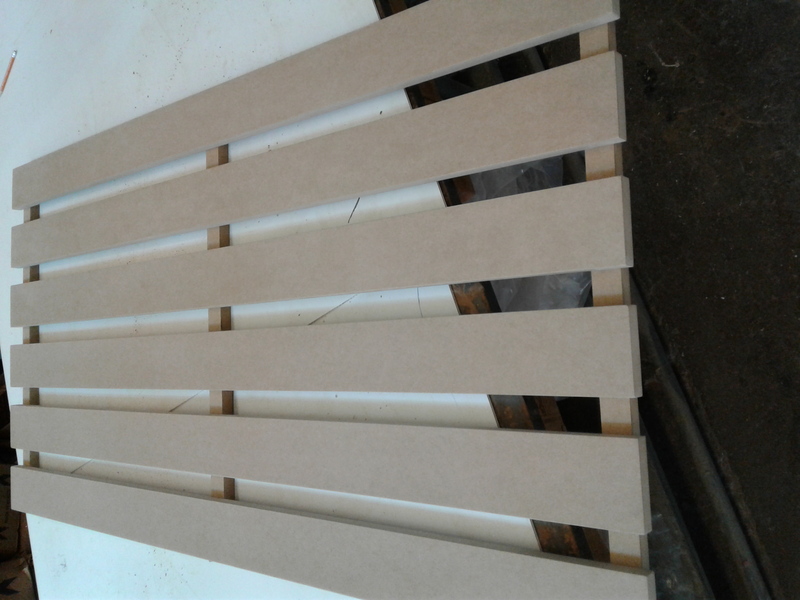 To create the pallet sign we began with MDF board, which is a great material for interior signage. It was cut and assembled to replicate a wood pallet. It was then finished to match the colour they use for their pallets. After the paint finish was complete, the text portion was added to the sign project. 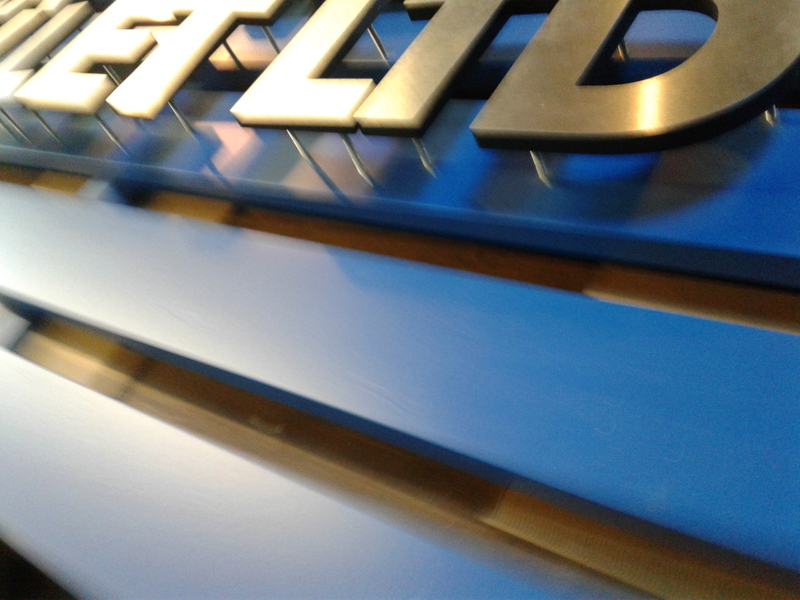 The brushed metal letters were pin mounted to the sign to create dimension. Once the sign was fully assembled, our installers placed in the reception area of Cambridge Pallet. Since its arrival both staff and clients have remarked with how much they like the new sign and that it is a great representation of the company. Whether you connect with in person at networking events or online through our social channels, we want to collaborate with you to create a sign that reflects your company and brand. Visit our CONTACT US page to get the process started.